Its major export partners are Germany, Spain, and the United States. Its main exports are machinery and transportation equipment, as well as aircraft. Its major import partners are Germany, China, and Italy. Its major imports include machinery and equipment, vehicles, crude oil, and aircraft. Located in Western Europe, France has a 2,751.00 km border with Andorra (55 km), Belgium (556 km), Germany (418 km), Italy (476 km), Luxembourg (69 km), Monaco (6 km), Spain (646 km) and Switzerland (525 km).In addition French Guiana has 1205 km border along Brazil and Suriname. It has a 4,853.00 km coastline. France is involved in territorial disputes over various islands involving Madagascar, Suriname, Vanuatu, and Comoros. Paris is the capital city of France. It sits on the river Seine in the north-west region of France. The population of Paris is just about two million people, although slightly more than ten million people live in the larger metropolitan area. Paris is nearly two thousand years old and is today ranked as one of the most populous urban areas in the European Union. The climate of Paris is of Western European oceanic, with average temperatures reaching 7 degrees Celsius during winter and between 15 and 25 degrees Celsius during summer. Another element is the fresh winds influenced by the nearby sea. Besides, Paris is a popular destination for tourists, mainly because of its Eiffel Tower, palatial churches, food markets, museums, and much more. France is a European country covering 643,801.00 km2 of which 0.52% is water and 640,427.00 km2 is land. The area also include the overseas regions of French Guiana, Guadeloupe, Martinique, Mayotte, and Reunion. This makes it the 42nd largest country in the world and slightly more than four times the size of Georgia slightly less than the size of Texas. Its geographic coordinates are 46 00 N, 2 00 E and Paris is the capital city. The name is said to derive from the Latin "Francia". Its ISO code is FR. France has a mean elevation of 375 m above sea level. Its climate varies from generally cool and mild in most regions of the country, with warmer summers and milder winters in the southern Meditterean region. Its terrain is mostly flat, with gently rolling hills in the north and west and mountains in the south and east. 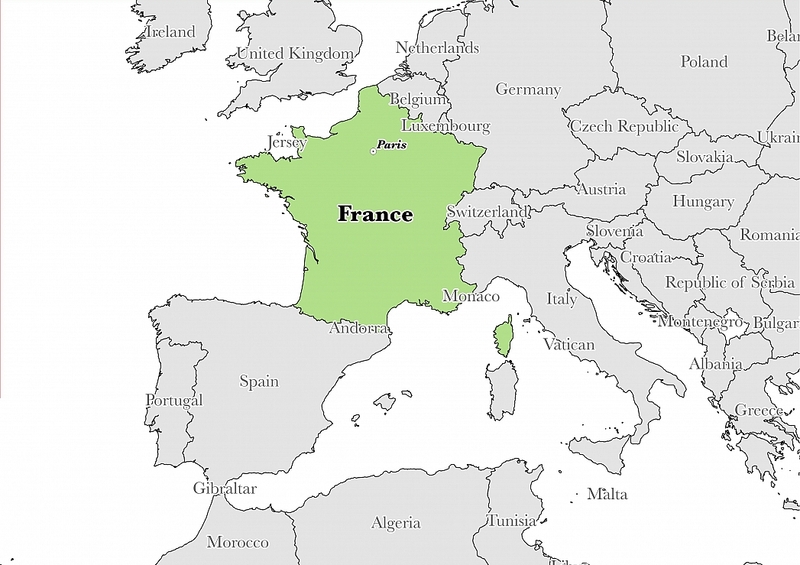 France has a population of 66,836,154 making it the 21st largest in the world. Much of the country's population resides in the southeast and the north. French is the official language. The major ethnic groups reported are Celtic and Latin with Teutonic, Slavic, North African, Indochinese and Basque minorities. The majority of the population is Roman Catholic, with a Muslim minority. French is the most popular language in France. It is used a first language by the majority and also serves as the official language. French has its origin traced as a Romance language which is a branch of the Indo-European languages. Other languages spoken in France include Germanic, Celtic, and Gallo-Romance dialects. The dialing code for the country is 33. France is an independent country. The French Republic was founded in 1792. Its constitution was last ratified in 1958. The Fifth Republic of France is a semi-presidential representative democracy. Charles de Gaulle founded the constitution after the collapse of the Fourth Republic as a result of ministerial crises as the Prime Minister had a weak hold over his Cabinet as the National Assembly could dismiss it and the Presidents roles were mostly ceremonial. In the Fifth Republic, the more powerful President who is elected by the citizens, the Prime Minister, and his Ministers make up the Executive. The last two positions are through Presidential appointment. France has a bicameral Parliamentary system with two houses of National Assembly and the Senate. The National Assembly has more clout over the Senate and would have the final word in case of a dispute between the two. The Judiciary is independent and separate from the other two branches. The President and members of the National Assembly serve for five-year terms while the members of the Senate get six-year terms. The Prime Minister does not have a fixed stay in office. Factoring in Purchasing Power Parity, France's GDP is $2,700,000,000,000.00 (USD) with $42,400.00 (USD) per capita. This makes it the 10th largest economy and its citizens the 38th richest in the world. The currency of France is the Euro (EUR). Its major export partners are Germany, Spain, and the United States. Its main exports are machinery and transportation equipment, as well as aircraft. Its major import partners are Germany, China, and Italy. Its major imports include machinery and equipment, vehicles, crude oil, and aircraft. 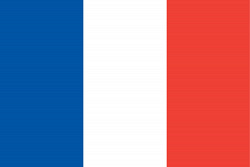 The French National Flag is known as the Tricolore and has three stripes of equal width colored blue, white, and red. The stripes are placed vertically with the blue on the hoist side, the white in the middle and the red on the fly side. The flag was adopted during the French Revolution when the colors blue and red were used to represent Paris, and the white represented the monarch. The French National Convention adopted it on February 15, 1794. The white flag of the royal family replaced it for a short time during the Bourbon Restoration from 1814 to 1830. Although many theories explain the origin and the meaning behind the colors, over time they have come to symbolize the ideals of the Revolution which were freedom, equality, and brotherhood with the Marquis de Lafayette getting credit for their combination. Louise David is believed to have come up with the order of the colors. Different versions of the flag have been and still are in use. For example, the civil ensign has the colors blue, red, and white in appearing in the ratio 30:33:37.